Day 3 consisted of a chipper that would challenge any CrossFitter. The South Texas sectional took place over the weekend, advancing another 60 athletes (30 men and 30 women) to the upcoming Regionals in Fort Worth, TX. Event organizer Jeremy Thiel reports. The Southern Texas (including Louisiana) sectional is this coming weekend. 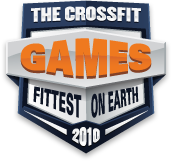 Here's an explanation of the weekend's events, along with a video of 2009 CrossFit Games competitor Carry Kepler explaining ROM expectations. Workout 1 (Saturday, 9am) "Dead Man's Row"